“He sweeps his hands across the dispatch box like he’s about to throttle somebody. I think he’s very much a 1980s politician. He’s a creature of the past to me, really, and by the next election he’ll have been in office for 12 years and parliament for 27. He’s a totally confrontational politician. He can never see any good in his opponent. Labour MP Harriet Harman reacted to the attack for MailOnline: "David Cameron's new style of politics seems to have lasted less than a month. He has woken the Tories from their slumber only to walk them up a blind alley of shallow personal abuse." Mr Cameron's strong attack on Mr Brown is an echo of a still more personalised attack made by George Osborne at the beginning of December. 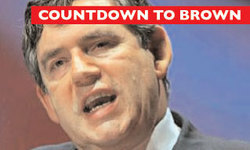 In the year that Brown may well succeed an increasingly embattled Tony Blair, ConservativeHome begins the New Year with the first of own critiques of Gordon Brown. Over on The Platform, Oberon Houston has dissected a recent speech by the Chancellor and compared the lofty ambitions with the sad record of non-delivery. Over coming months we'll be spending more and more time focusing on Labour's failures as well as promoting authentic conservative beliefs within the Tory Party.